The New York Times ran a graphic on Monday that included two extinct postal abbreviations for Maine and Texas. 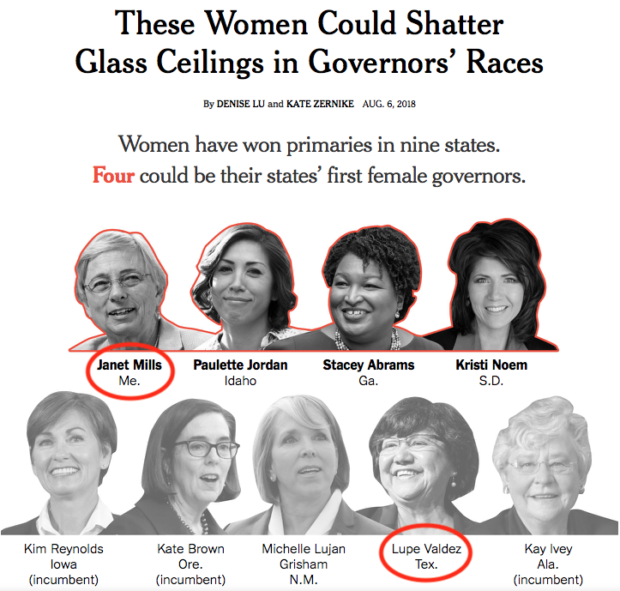 “These Women Could Shatter Glass Ceilings in Governor’s Races,” a story about women running in governor’s races across the country, came packaged with a fancy-looking graphic right below the headline. Unfortunately, whoever made the graphic clearly did not have knowledge of the correct abbreviations for states. The New York Times was likely going for standard AP style, as the rest of the abbreviations look accurate. However, AP style also dictates that Maine and Texas are two of the eight states that never get abbreviated. According to a US Postal Service document, the abbreviation “Me.” was replaced with the standard “Maine” in 1943. Similarly, “Tex.” stopped being an acceptable abbreviation in 1963 when the USPS adopted the five-digit zip code. CORRECTION: An earlier headline said the New York Times invented “a new” abbreviation. It was an error in the editing process and has been amended.